In May 2013 a storm exposed mysterious hollows on the beach at Happisburgh in Norfolk. Follow the progress of the research team as they realise they have found human footprints that are around 900,000 years old. Happisburgh (pronounced Haysborough) is one of the most important archaeological sites in Europe, the location of the first known human presence in Britain. Dramatic erosion of the coastline is exposing exciting new finds, but scientists are in a race against time before they are lost to the sea. When foot-shaped impressions were exposed briefly in 2013, a team worked quickly to photograph the patterns from different angles. The photographs were used to create detailed 3D digital models, which confirmed the hollows were trails of human footprints. By measuring the footprints, the team were able to estimate the height and weight of the individuals who made them. It appears a small group of adults and children, between 90 and 170 centimetres tall, left the trails as they walked along the mudflats of a river estuary. Using pollen in sediment layers, the scientists dated the footprints to between 850,000 and 950,000 years ago. This age means the footprints may have been left by Homo antecessor, an early human species known to be present in Europe at that time. Not only are the footprints the earliest evidence yet of humans in Britain, but they are the oldest human footprints outside Africa. 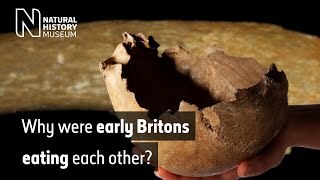 This research was part of the Pathways to Ancient Britain project, a long-term collaboration between the Natural History Museum and other research institutions. Museum research and collections are helping to answer where, when and how humans evolved. Listen to the tale of the first adult Neanderthal skull unearthed and what we've uncovered about our close relative in the past 160 years.